I knew how the world worked; I knew it could be cruel, and I was not content to let it remain so. Give me all of the historical fiction about flawed women doing things that society says they shouldn’t do!!! 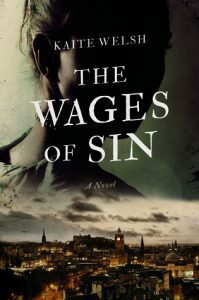 Kaite Welsh’s The Wages of Sin is about a woman named Sarah Gilchrist who “ruined” herself with the involvement with a man who took advantage of her. She moves in with her aunt and uncle to start anew, and she enrolls at the University of Edinburgh in the first year it allows female students. The plot goes back and forth between her past and her present and it’s a little slow moving, but I enjoyed that. I felt like Welsh easily incorporated the day-to-day life of this first class of female medical students to show the reader the kind of resistance those students felt in their everyday experiences. It also explores the victim-blaming and -shaming rhetoric that women still face regarding their sexuality and their choices and how it can be damning to assume anything about anyone without knowing the other person’s full story. While reading this, I felt like this story also highlights the injustices and prejudices women face today in all sorts of sciences and male-dominated fields across the board. Sometimes it was troubling to read because I’ve even experienced similar things. However, that’s what I like most about good historical fiction. It illuminates the problems of the past and present. I like reading historical fiction for an escape from the present like so many others, but I also like reading historical fiction because of the explorations and struggles people have faced throughout history. It’s reflective and contemplative, and it’s always a joy to have a relatable heroine telling us her story. I’m going to be thinking about The Wages of Sin for a while, and I’m pleased to know that there will be more of Sarah’s story, because most of this novel felt like a set up for so much more. I think I’d be disappointed to know that was the end, because it ended with so much hope and promise. I can’t wait for the next one! If you’re a fan of Deanna Raybourn’s Veronica Speedwell series or enjoy reading feminist historical fiction, I think you’ll like Sarah Gilchrist and her adventures. Thank you to Pegasus Books and Netgalley for a review copy!